Mayor James made a special visit to Citizens of the World Kansas City today to read Turn the Page KC's new book, 'Our Home Kansas City' with kids in Kindergarten and 1st grade. This development center is the second phase of construction at the Meneilly Center Campus. The building completes a master plan originally approved by Overland Park Planning in 2005. The new building uses the same exterior materials and scale of the Tillotson building to provide a continuity, but has been configured differently to better reflect the different use and requirements of the Children and Family Development Center. This portion of the site slopes three feet within the length of the building. In order to provide ground level access from classrooms and all major use areas, the building steps gradually down to the west with 8” level changes and intermittent sloping circulation areas. The multi-use building will provide day care classroom and support space for 132 students. The day care portion of the building includes a storm hardened safe room space and food preparation and dining areas. A flexible 250 person multipurpose use space with associated meeting, conference, and storage areas is included as well. We want the building to efficiently provide all the functional requirements of the staff and committee, In addition, we want it to be a place the children enjoy and are excited to come to each day. We want the Architecture to be bright and cheerful and to supplement the smiles and positive attitudes of the staff. Arrival starts at a broad entry canopy with tree like columns, once inside the building, a custom door provides a “child’s” entrance to the classroom area that is too small for adults to go through. The classrooms are joined with a playful multilevel interior circulation space that is flooded with daylight from south facing roof monitors above. Throughout this space there are little surprises, such as windows in a variety of shapes and sizes to provide views into the classrooms at child height. There are color coded floor areas with lower scaled ceilings at the classroom entries. The classroom ceilings all slope up to the exterior walls providing a light and more spacious feeling to the classroom. The windows of the classrooms have tinted glass panels that reinforce the entry and room accent colors. A favorite area of students and staff will certainly be the nature explore outdoor classroom/play area. The design incorporates a nature centered play and education concept. This portion of the project will be installed once the existing building is removed. The building is designed to be a good steward in the use of materials and resources. The building is low and compact allowing a central utility core to most efficiently supply heating and cooling. Multiple equipment zones allow utility savings for those areas of the building when not in use. 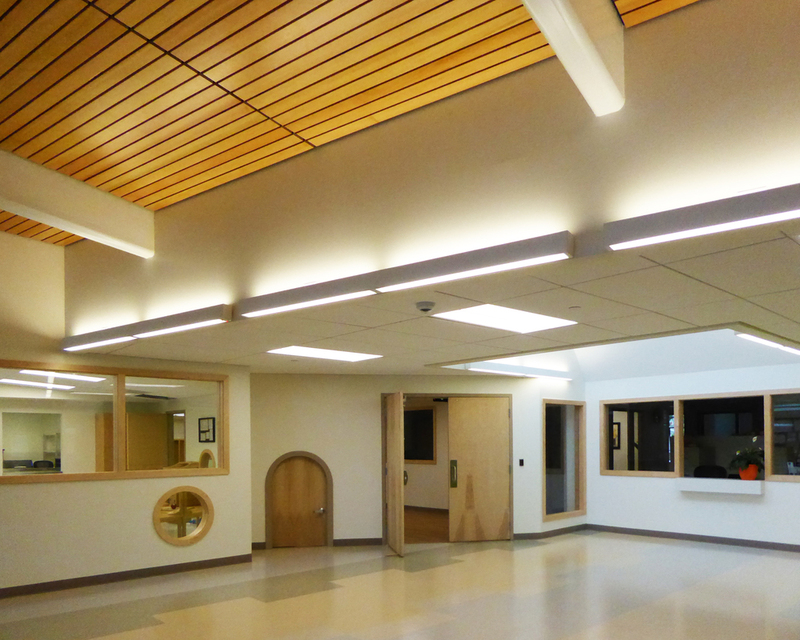 Light monitors above the central circulation space provide daylight deep into the building and will often preclude the use of artificial light there altogether. The lighting throughout is high efficiency LED. The classrooms have a sophisticated control system that provides daylight harvesting and programmable dimming options. Parking lot lighting is LED as well. The building exterior is very well insulated and has been constructed with care to eliminate cracks and unwanted infiltration. Deep roof overhangs to the south allow the sun into the classrooms in the winter months if desired, but keep the walls in shade during the heat of summer. There are few glazed openings on the east and no openings for the harsh west sun. Like the Tillotson building, this building will receive an initial 12 KW photovoltaic electric rooftop installation, with equipment sized to add many times that capacity in the future. Additionally, the rooftop will provide an active 120 gallon solar hot water heating installation. All building roof water is diverted to a rain garden collection and percolation area that serves as a buffer and landscape area between the building and 99th street to the north. An electric vehicle charging station will be provided on site as well.